If you are thinking of buying an Apple iPad, please hold off for now… A dummy iPad 2 surfaced in Las Vegas last week and speculation is swirling over whether it is based on leaks from the factories, an Apple plant or just a hoax. Several Chinese iPad accessory makers showed off iPad 2 cases and one had a non-working dummy model that is slimmer than the original iPad, has better speakers and built-in cameras. Apple allegedly provided the dummy models to accessory makers so they could build their products ahead of the launch. Amazing footage from a heroic tugboat! The tugboat pilots who steered a large section of down the swollen Brisbane River, avoiding the Gateway Bridges and vital infrastructure, have been hailed for their "amazing" work. On Thursday morning, the tug steered the 300m long section of a floating boardwalk, which broke away from the banks at New Farm late on Wednesday night, down the river which was moving at an estimated 10-12 knots. Police closed the Gateway Bridges three times overnight because of concerns it could crash into their supports. 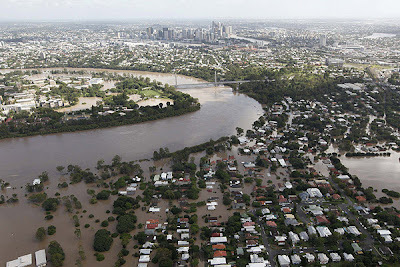 Go to www.qld.gov.au/floods to donate to the Queensland flood appeal. Heavy rain in the sunshine coast, releases from the giant Wivenhoe Dam and high tides had causes major flood peaks in Queensland. The river levels rising above the historic 1974 floods. That peak in the depths of darkness will send water, not just lapping the sandbagged doorsteps, but washing forcefully across single storey rooflines of 19,000 homes. Many, many thousands more will have some lesser inundation. The city is now suffering from food shortages, raw sewage contaminating the water, low fuel supplies, no electricity or gas, intermittent mobile phone coverage. Everyone has prepared their houses as much as possible. There is a report by a man says he has seen a bull shark in a submerged section of Goodna, Ipswich due to the flood. 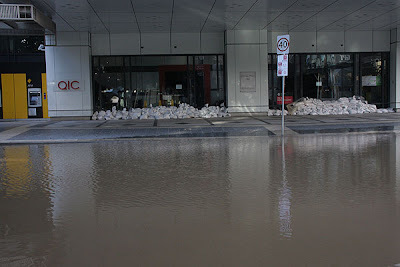 Please visit www.qld.gov.au/floods to donate. Moreover, champion cyclist and seven-time Tour de France winner Lance Armstrong has become the latest celebrity to back the Queensland flood appeal. He had pledged $50,000 to help victims. Last month, TaiwaneseAmerican.org's Ho Chie Tsai visited Taipei and drops in to say hello to Janet and catch up with her recent adventures. The first interview was done in February 2010 at MIT and this is the second one. If you don’t know her, maybe there is something wrong with you… Ops, I am just kidding:P. Let me introduce you again. She is Janet Hsieh 謝怡芬, the beautiful model and TV show host of "Fun Taiwan" on the TLC (Astro Channel 707), is one busy girl who is always working and jet-setting worldwide. -Janet Hsieh in support of NCF2010, only $1 per day and you can make a difference! Besides the price is more expensive than Australia after FOREX conversion, check out their translation from Chinese to English. I think this translation is too vigorous... LOL!